Could this be the best cycling scheme in the UK? 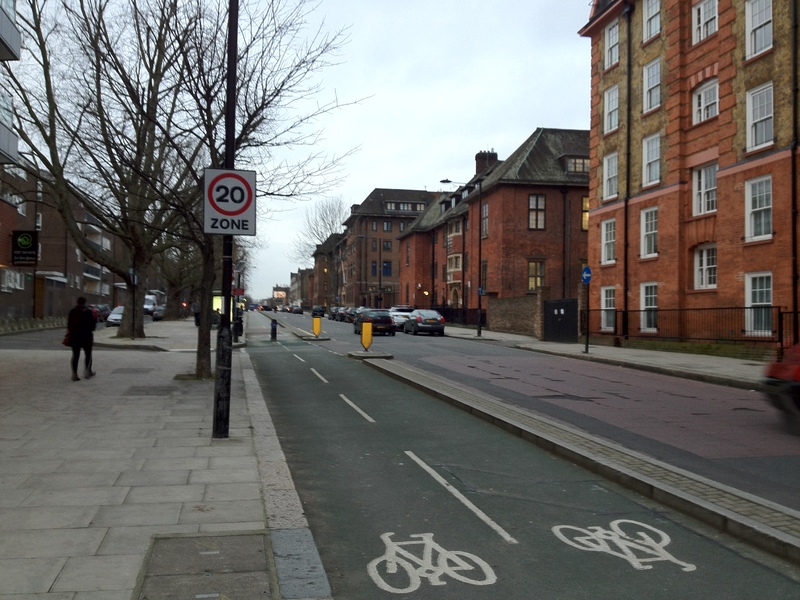 Amidst all the attention being drawn by the extension to Superhighway 2 along Stratford High Street, announced on Monday, I thought I’d write about another consultation in London, one which closes this Friday – the changes to Royal College Street in Camden. This street already has a cycle track running along it; a two-way one on the western side, kerb separated from the main carriageway. The design, while adequate, is far from brilliant. It’s a little too narrow for a two-way track, and it’s not really a good idea to have a bi-directional track running across multiple side streets, even if the main road itself is one-way (this makes the track a little safer than the one in Tavistock Place, which is two-way with a two-way road, a recipe for confusion). It also peters out at the northern end, abandoning you if you wish to continue north towards Kentish Town, rather than towards Camden itself. Nevertheless, I do find it one of the most relaxing roads to cycle on in London. Free from the hassle and stress of jostling for space with motor vehicles, I can idly pedal on my way without having to worry about taking primary, or assuming a good position, or staying out of the door zone. 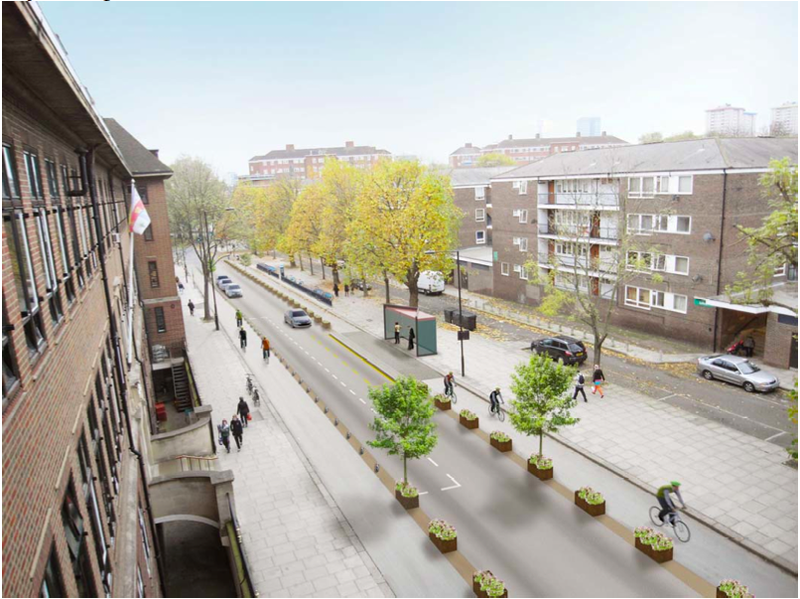 The great news is that Camden are proposing to make this street even better for cycling; what looks to me like the best scheme in the UK, and getting close to best practice. In essence, the existing two-way cycle track will be turned into a wide one-way track northbound, two metres wide. A corresponding two-metre track will be installed on the opposite side of the road, heading south. This will be achieved by narrowing the carriageway (currently approximately two vehicles wide, although there are no markings on it) down to just one lane. 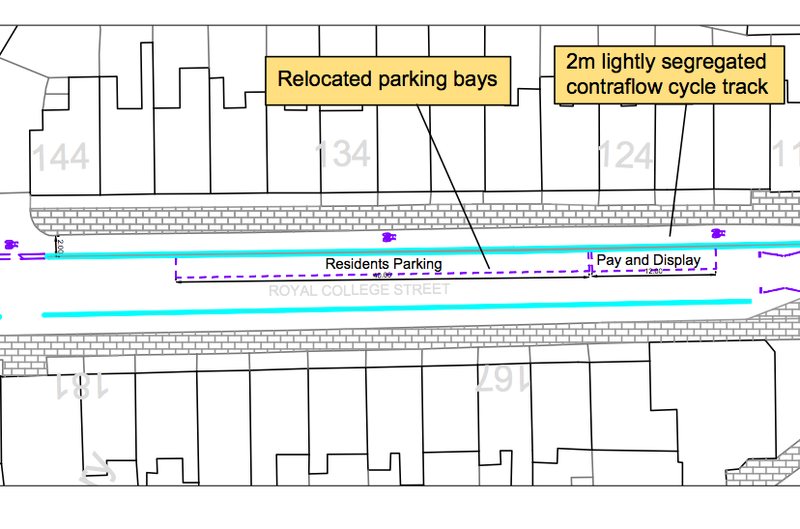 Parking on the street will be maintained, but placed on the outside of the cycle track. The bus stops will remain in the road. That means when a bus is halted, motor traffic will come to a complete halt too, while bicycles and pedestrians can continue. 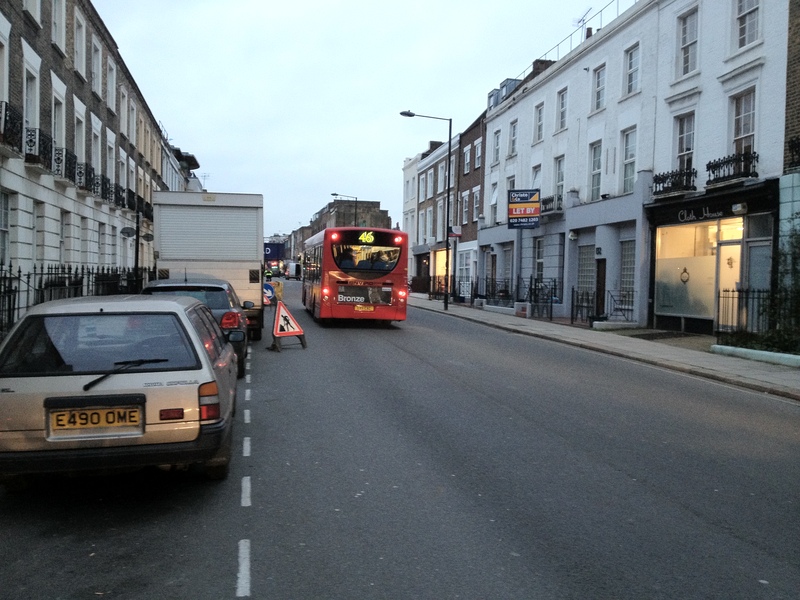 The other bit of good news is that this arrangement will run right through to the junction with Camden Road. At present, as I mentioned earlier, the cycle track just peters out at Georgiana Street, heading off towards Camden Town itself. Not much use if you wish to continue straight on towards Kentish Town. And then run the gauntlet of a two lane road, with parking on the left, as vehicles jostle for position heading up to the lights at the Camden Road junction. This isn’t very pleasant, certainly compared to the serenity of the cycle track you have just left. The good news is that the parking on the left will be moved over to the right, and those 2 metre wide cycle tracks will be built on both sides of the road, leaving just one bus-wide lane in the middle of the road. 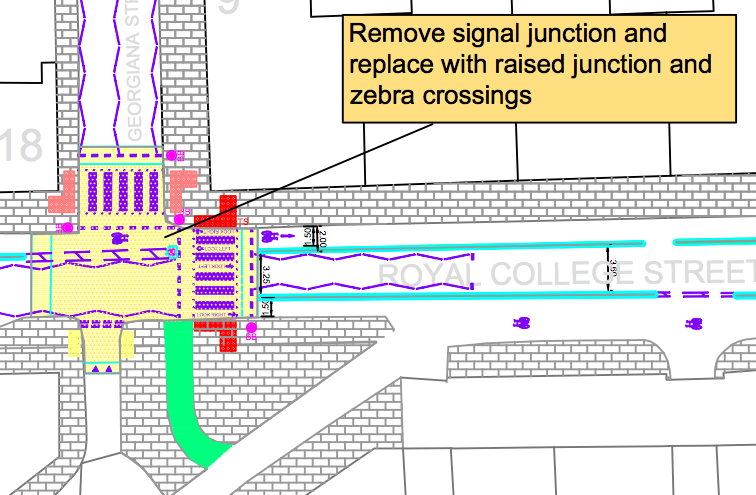 will go, to be replaced by zebras across both arms of the junction, on a raised table. This is a considerably better arrangement, for both pedestrians and cyclists. The segregation of the track from the carriageway will be achieved by ‘light segregation’ – what looks like planters, boxes and trees, from this mock-up. This will provide a good degree of separation from motor vehicles, along with the parking bays, and will bring some extra greenery to the streetscape. The existing zebra crossings on the road will be maintained, and will continue to pass straight across the street, and the cycle tracks. I have only a few minor concerns. Firstly, that there no details for what happens when the cycle track meets Camden Road, at a major junction at the north end of the street. This must be because Camden Road is a TfL-controlled road (and part of the TLRN), and so it would be up to them to bring about changes to that junction. Camden Council’s remit presumably runs out just short of the junction, and they’ve been forced to leave it as it currently stands. Secondly, at the southern end of the street, a way has been found to get the southbound track across Crowndale Road, and into the continuation of the route towards King’s Cross and St Pancras. It looks – to me at least – a little fiddly, and could do with some tidying up. 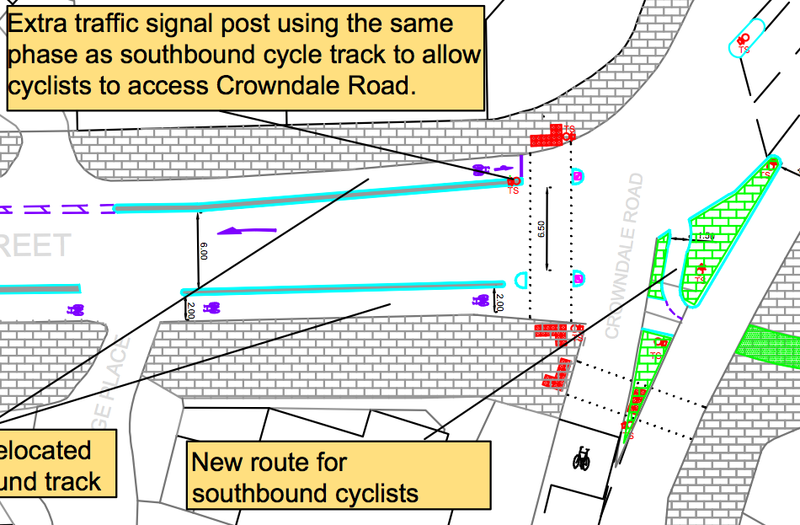 ‘New route for southbound cyclists’ – but does it have to be so wiggly and tight? The existing induction loops on the track will be moved to the new southbound track; I have to say these currently work quite well, and if you position your bike over the loop, the lights change in your favour reasonably quickly. I hope this continues to happen. Thirdly, the tracks – while running behind the bus stop itself – will continue to run in front of the bus shelter (see the artist’s illustration above). It might have made more sense to route the track behind the shelter, where there is space, than to have cyclists passing between the shelter and the bus stop itself (this is what TfL are now proposing on Superhighway 2). In mitigation, only one bus route runs along Royal College Street, and there is not a great deal of bus passenger movement here, so this may not be the greatest problem, at least on this street. 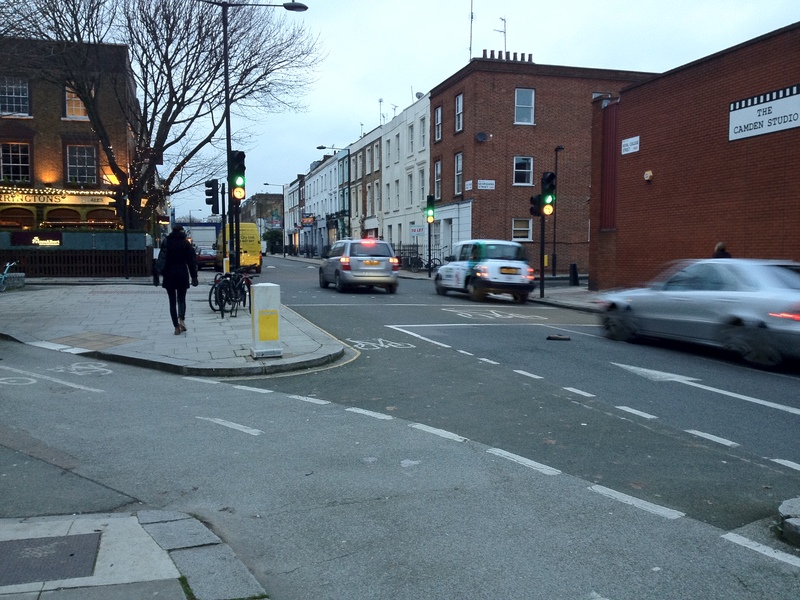 Finally, a very minor quibble – I’d like see 45° kerbs between the pavement and the cycle track. These are better for pedestrians – particularly those with mobility problems – and for cyclists. It’s much more difficult to crash your bike if you hit a 45° kerb, and you’re also much less likely to trip over one if you’re walking. All in all, though, this looks like a fantastic scheme, and I would urge you to write to Camden Council to support it, even if (like me) you are only an occasional user of the street. They’ve done a fantastic job. Full details of the consultation are here [pdf]. You can fill in the form and post it, but it must be received by Friday. The better alternative is to email your comments to brian.deegan@camden.gov.uk. This entry was posted in Camden Council, Go Dutch, Infrastructure, London, Subjective safety, Transport for London. Bookmark the permalink. 52 Responses to Could this be the best cycling scheme in the UK? 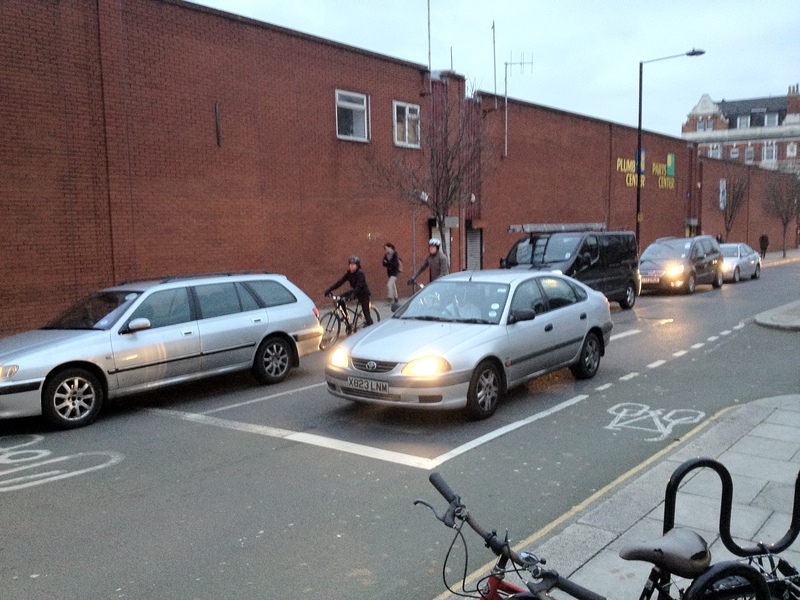 Is it a cycle track, or a cycle route…? you race on a track, use a route to get somewhere…i suspect terminology might hinder focused thinking. Looks jolly good though…whatever its called. ‘Cycle tracks’ are the standard term for these kinds of paths that run parallel to roads; I know that ‘tracks’ are also used for racing, but cycle tracks are suitable (or should be) for all kinds of cycling. I don’t think terminology will be too much of a problem! i know, but I don’t like it, the more that can be done to be clear about something the better, just because word is used, doesn’t make it the correct word. .The more we can disassociate the bicycle for sport from the bicycle for transport the better. its not a track, it might be a lane, a route, a cycleway, but how is it a track? (it’s all in the detail). (but pleased you think terminology will not hinder progress). Agree to an extent, although I’m not sure ‘cycle route’ is a good alternative, because that suggests (to me, at least) a way of getting from A to B, on a variety of different kinds of treatments. I think we’re stuck with ‘track’, to be honest. Maybe as these tracks come to be used more and more, then we’ll come to associate the word itself with cycling that isn’t necessarily racing. The US seems to be converging on ‘protected bike lane’ for a bike lane that is physically separated from the road whether by barriers, kerb, or parked cars and ‘buffered bike lane’ for one that is separated from the door zone and traffic by hatching on the roadway. Why is it not a track? I create tracks for use with my Garmin. None of those to date have been for racing. Should Garmin (and possibly other Satnav manufacturers) stop using “track” in case their customers think they can only use them for racing? The fact that track racing takes place on a track doesn’t invalidate the far more widely understood dictionary definition of the word. 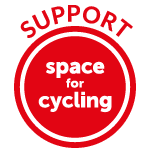 If you really want to divorce cycling for sport from cycling for transport, shouldn’t you be pushing for the word “track” to be removed from sport cycling? After all, track cycling already has it’s own specific word, and nobody is going to get confused and start thinking they can commute through Camden on a velodrome. I’m a little confused by this section…. I would’ve thought it safer to have a two way cycle path going across a two way road than across a one way road. My concern would be that cars pulling from side roads onto a one way road will typically only look in one direction, because they know the road is one way. At least if the road is two way, drivers are more likely to look both ways for other cars? Chris, if you read the short consultation document, your thoughts are exactly the reason the changes are proposed. Otherwise, why change one of the few segregated, useful cycle routes! The road narrowing and new cycle lane on the eastern side of the road are a good thing, but should we welcome the proposed light segregation? Especially the removal of the kerb between the current segrated track and the road way. The artist’s mock-up looks fine, but will it reflect reality? If you re-visit Byng Place and the contra-flow on Russell Square where proper segregation was removed you can see that conditions are now worse for cyclists. My fear is that there will be insufficient planters after a few years of use, which will open the cycle lane to illegal parking, placement of skips etc. The devil will be in the detail, of course. I think if we get what’s in the mock-up, the separation will be much better than the current situation, which is just a kerb. But as you say there may be issues with planters disappearing. I hope the separation is reasonably permanent. I don’t really know the area too well and I don’t know how busy this road is, but surely the changes to the road (for motor traffic) will make this route less convenient and therefore reduce traffic flow. At what point is segregation still necessary if motor traffic is vastly reduced? Could the same effect not have been acheived (cheaper?) through changing it to a non-permeable route to motor vehicles and a through route for cyclists? That probably would be cheaper, and would work just as effectively. If you eliminate the motor traffic, then obviously you wouldn’t need the segregation. Not sure about the viability though – the bigger picture in Camden is a mess of one-way streets, and there is a big Post Office depot on the street, that probably will continue to need viable access. That said, it’s worth mentioning that many Dutch streets that did have cycle tracks installed in the 70s and 80s are now being ‘unwound’, and returned to ‘bicycle streets’, with only residential access for motor vehicles, and no cycle tracks, because they’re no longer needed. But they’ve arrived at that position after decades of careful and comprehensive city-wide planning. We only have one street. It may be if interest for readers to know that the cycle track was installed on Royal College Street in 1999/2000 (not 1990 as I said when sharing this item on facebook). It made use of two short (10 metre long) sections of cycle route at either end of the street that were originally put in in the 1970s in a GLC project. As one of those involved in the present track it is very gratifying to see that our efforts are to be improved. BTW – Fred Smith – very, very few cyclists use Camden High Street, a real horror for cycling but many use the Royal College Street track. When first installed in 1999/2000 the number of cyclists using the street increased threefold and the numbers have risen steadily ever since. Cyclists have voted with their wheels and emphatically rejected the anti-cycle track philosophy of a small minority of cycle activists. London Cycling Campaign members voted for a ‘Go Dutch’ strategy for London, ie lots of cycle tracks and other continental-style measures. Hi Paul, I was replying to the comment regarding motor traffic – obviously it wasn’t clear that was what I was referring to. There’s no anti cycle track philosophy here – I’m an LCC member and you can see my original ‘Go Dutch’ comment a few lines up! Although it’s not the nicest place to cycle it does have the advantage of being very direct from Kingsway up. For people not making a regular journey (or who don’t know about the cycle routes) it is the obvious way to go, even if it might not be the best way. Given the justification for the proposal is the poor safety record of the present track, then I think I would show a bit more humility if I had been in any way responsible for it’s creation and perhaps acknowledge that the experienced cyclists that warned of the danger this sort of provision causes at junctions might have had a point. Hi Pete, thanks for the comment. I think you’re mixing up two things, poor specific design and alleged inherent lack of safety. Our original proposal was for the problem junctions (which only form a rat-race route and are unnecessary) to be closed to through motor traffic. On this we were over-ruled. I don’t think I can reasonably be asked to accept responsibility for something that I specifically proposed should not be done (similarly at Gordon Square on the Bloomsbury track where the problem is a taxi rat-run to Euston Station could easily be closed to through motor traffic). Your comment suggests that you are of the opinion that segregated tracks (which is what I presume you mean by the wording ‘this sort of provision’) are inherently unsafe. I would point you to the fact that cycle safety is much better in countries which go in for extensive ‘provision of this sort’, so I don’t see how you can be correct in your assertion. Another point you shouldn’t overlook is that part of the motivation for the upgrade is that the present design is experiencing saturation levels and extra capacity is needed. Thus our original idea that the less desirable approach of using one two-way track should be replaced by two one-way tracks is validated by the number of cyclists who prefer to use the track even in its present imperfect design. I would also point out that the RCS and Bloomsbury tracks are popular with many very experienced cyclists. The number of ‘experienced cyclists’ who prefer St Pancras Way/Camden High Street or Euston Road over RCS or Bloomsbury is minimal. What you call ‘experienced cyclists’ should really be called that ‘tiny, tiny minority made of up old-fashioned British-style cycle activists who are blind to what has happened on the continent over the last 45 years’. I tried Royal College Street today and even in it’s current form it’s better than most (except the potholes). With the works it should be pretty awesome. However it’s not obvious to me how this links up at the Southern end for people coming up from Kingsway (I tried it today and ended up down a few dead ends). 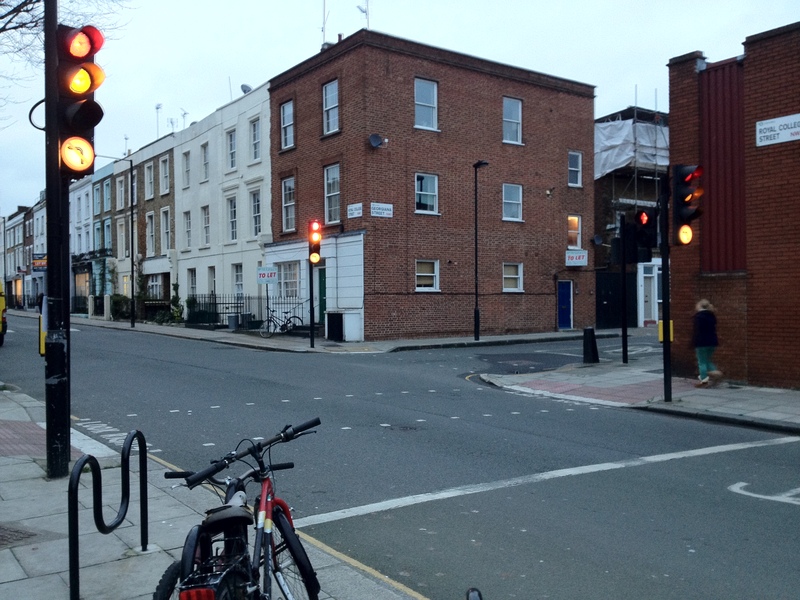 I also ended up on Camden Road at the Northern end which was full of traffic and cyclists jumping lights 😦 I’m going to try out it again and I think I can go on up to Kentish Town instead. If anyone knows how best to get on to it from Kingsway I would appreciate suggestions! OK, so if anyone has the same question it seems to be that if you’re on Kingsway you’ve already made your first mistake and will need to do 3 sides of Russell Sq to make a legal turn to get on track. It’s better to use the cycle routes in Covent Garden via the link at the end of Waterloo Bridge/side roads -> Head North to the British Museum & up the side -> East along the top of Russell Sq and past the front, then left up the side, of the Brunswick Centre -> Turn left on to Tavistock Place and then right on to Marchmont St.
A this point the cycle lanes start to join up in a more straight forward way. My comments on this consultation are going to be that the South end really needs to link a bit more directly to the routes down to Kingsway area and also up through Kentish Town – even introducing advance stop lines on some of the adjoining junctions would help make it seem more like a network. I had a beer last night with my local councillor to discuss various street-related issues. He was telling me that formal consultations are a “numbers game” – in effect, they have to give almost equal weight to objections/support whether they come from right on top or the other end of the country – yes, they had people resident in Soctland objecting to parking proposals in Surrey! The good news about that of course is that if you feel shy about commenting on RCS because you don’t live/work.cycle there, don’t – your comment still counts. If a councillor votes on a scheme because of the numbers game, then he or she is an unsophisticated fool. There is no rule or law which tells councillors what weight they should give a comment – that is why they are elected – to make decisions. I have run more public consultations for highways schemes than I ever care to remember and you can get a feel for where they will go. In my experience anything which takes away private parking will often kick off, plus anything which it not seem to help private car use (a symptom of outer-London). So, if I have a bus stop access scheme which seeks to restrict the road in order for buses to stop and it takes away “someones” parking, I will probably get an objection. If that person is disabled for example and the scheme would be a massive hardship to them, then there is a good argument that this issue be given a lot of weight and probably the scheme needs redesigning. If the objection is from somebody who doesn’t live near the bus stop, then they should not get any weight in my view and I tend to give my written advice along those lines. Yes, there will be councillors who look at the numbers without reading the report and vote that way as well as councillors who see what is happening on the night with the discussion and go with the vote. But (to be fair), there are some who will have visited the site before hand and will have relevant questions ready to ask at committee. Of cycling is always a “fun” issue and I have had to argue with councillors who did not even want to see money spent on basic advisory lanes (yes I know that is a debate itself), I have have sat at committee meetings with cabinet members (with their ward hats on) stating they had to go along with the scheme in order to play the funding game for the schemes whey really wanted and I have had committee councillors stating in public that they did not like cyclists and thought they were a menace. Welcome to local government! Interesting choice, going back to re-do one of the best cycling streets in London. On the one-hand we should end up with a brilliant example of cycling infrastructure that we can point to in future campaigning, but on the other hand we have an amazing piece of cycling infrastructure that connects one nasty road with another nasty road. In Camden you have two streets where Dutch inspired infrastructure exists, this and Tavistock place. While these do need an upgrade, I really hope this is part of a bigger plan to connect these two streets with cycling infrastructure of the quality seen in this example. Then you’ll have the start of a real cycling network. These changes are nice but they won’t bring about a growth in cycling in isolation. I agree with all you say, but you do have go start somewhere and then campaign to join up the little links into bigger ones. As one of the people who initiated the RCS route, I can say that we proposed it with the idea that it should really be two one-way tracks; a two-way track was a second best option. But we had to start somewhere – and no one else at the time believed that the route could ever be popular enough to need two one-way tracks (I recall the then London-wide cycling officer telling me that he supported the idea personally, but there would be no one wanting to use a cycle track). It’s taken over 10 years to get here, so the real need now is to speed up the process. I hope that the revised RCS scheme can help campaigners pressing for that real network by showing how you can Go Dutch on London roads (I also recall the then head of TfL trying to tell me that London’s roads were all too narrow to accommodate tracks). Good to see, I don’t live in Camden any more, I used to cycle up and down Royal College St, it’s a popular route and a useful way to get from anywhere north through Camden either going straight into central London or heading for the City, so I’m sure it will get plenty of use. I’ve been knocked off three times by cars turning left on that road and at the bottom of the hill. Dedicated paths are the way to go with our own right of way at junctions. it’s not clear who as right of way in some cases and I hope that the improvements hear and in other dedicated paths, that, to me is the key factor. I lived in Holland throughout the 90’s and I think there’s no reason we can’t go dutch. Over a decade or two the investment would save the economy alot in other areas like health and sustainable transport. I’ve only just now – rather belatedly – read this post, so I’m too late to add my comments to the consultation. I don’t use this route, but I do sometimes use the Tavistock Place route and it’s actually one of my favourite places to cycle in central London. It’s not perfect, I know, but it’s the best example of a dedicated bike lane I’ve come across. I feel safer and more relaxed when I’m riding along there – it’s my space and I don’t have to share it with cars or pedestrians. It makes cycling much more enjoyable. Kudos to Camden for taking the initiative with this route, and with the planned redesign. I just wish more boroughs would follow their lead. 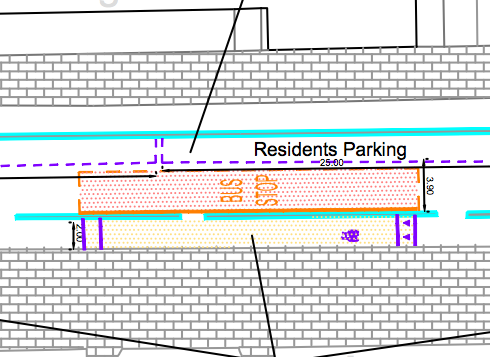 So how big is the dooring buffe zone between the residents parking and the cycle track? It looks like a very dangerous “none” in the drawings. The track is 2 metres wide; most cyclists will be on the left hand side, well away from the cars. Furthermore, drivers will be facing oncoming cyclists, so can see them coming. Finally, if a driver is so negligent as to open a car door while looking straight ahead at an oncoming cyclist, his door will open out at angled path to the cyclist – far less serious than from the opposite direction. Unsafe assumptions. Doorings are responsible for one in ten cyclist deaths in London and one in nine serious injuries, being the equal top cause of serious injuries. There needs to be a buffer zone both to protect cyclists from opening doors and as somewhere for the car occupants to stand and mill while getting out of the car, unloading the car and helping others e.g. young children out of the car for the safety of both the cyclists and car occupants. I take your point, but I wouldn’t infer too much from those statistics, for the simple reason that those deaths almost certainly occurred as a result of doors being opened while the car was facing in the same direction as the bicycle was travelling, which is far more dangerous as it presents an immovable barrier, rather than simply folding away, as would happen a bicycle is travelling in the other direction. Likewise many of those deaths would have occurred from the cyclist being deflected into the path of other vehicles. Again this is not a consideration in this design. As this is a lightly-used track, people will be cycling around two metres away from the parked cars in almost all instances. Yes, a buffer area is required, but I think your concerns are greatly overstated. I don’t want to hit a door whichever way its opened thank you and the statistics demonstrate that drivers and passengers opening doors without looking is a common occurrence whatever the outcome. If as you say all the cyclists are going to be bunched over on the far side, why have a 2m wide track there in the first place? You can remove the bit you think they’re not going to be using and covert it to a buffer zone. Of course everyone will then say the cycle track is too narrow giving lie to the suggestion they will not be using the full width. When the current track was first put in side roads were said not to be a problem but Christine has reported above being knocked off three times by turning cars and the consultation itself reports an above average number of accidents on the road, mostly caused by cars and side roads. And where did I suggest that? I merely pointed out that your statistics about deaths from doorings in general were not a sound basis to make claims about the risks of dooring deaths on this particular track, for the reasons I have repeated several times now. I’ll let you come up with an answer to that question. It’s not difficult. You suggested that it didn’t matter as much if you were doored that way (see your first reply). It matters just as much to me. I don’t want to be doored either way. And do you have any evidence that your track will be uniquely different from the common doorings across the rest of London or is that more hope and expectation against the inconvenient evidence? And I’m sure if you could have come up with an answer you would have. It should be fun seeing commuting cyclists mixing it with parents unloading buggies and children onto the cycle track. No, I pointed out that the risk of serious injury is much, much smaller following a dooring on this kind of arrangement. Do you understand the difference? Or are you actually suggesting that being doored one way and suffering a slight injury like a grazed knee, or doored another way and suffering a more serious injury, would matter “just as much” to you? Actually, there was quite a lot dooring in the Netherlands. I remember my father coming home with a broken nose because someone opened the car door when he cycled past. and my dad kicked it shut in a reflex. Unfortunately the driver was a very big and unrepentant man and didn’t think twice about hitting my dad. Of course, this was in The Hague somewhere in the sixties, years before we had cycle tracks and a safe infrastructure! Hope this takes away any fears Tony has on a safe(r) infrastructure in the U.K. If you really don’t like it you have the option of using the road. You can never please everyone and maybe it’s not perfect, but this scheme looks pretty good to me. Oh and I think most cyclists would like this lane and will vote with their pedals! He actually agreed with your comment. He only disagreed on how serious this is in the context of London cycling in general (I’m sure we’d all like it to be much better). The two metre cycle lane is useful as cyclists will be able to see better which cars have people in them as they are face to face, and overtake accordingly. It is only the passenger side which will open – which unfortunately might be kids, but whether this would in reality be a significant problem I don’t know (most cars have child locks available). While we can all find fault if we try, it would be great to know your better proposal for this street? Slight correction to your post, Fred – it will only be the driver side doors that will be on beside the cycle track; the parking bays are only on the eastern side of the street, beside the southbound track. True – you can tell I don’t drive a car! Tony, can you give me a reference for these statistics? I’m interested in them for another road safety topic. Not quite true – the comments section is for people who don’t waste my time wilfully misinterpreting what I write (I see that you are still pretending that I think dooring incidents are always no more serious than a grazed knee). Quite frankly I was losing the will to live responding to points and arguments I hadn’t even made. I’m out of here. Its clear that you are quite prepared to doctor your posts and delete mine to avoid inconvenient questions. I see that you have now changed it back to admit you did propose dooring incidents in that direction were no more serious than a grazed knee having denied it but now saying of course you didn’t mean it and it was my fault for thinking you might have. I’m off now to convince a well meaning councillor that a 1m shared used path past a primary school and with two bus stops, six side roads, 8 premise entrances including a garage forecourt and 44, yes 44, residential driveways over which it has no priority is not acceptable/viable as a major commuting route against the road with its priority throughout and no schoolkids on it except at the crossings. I have a bet with myself how long this post will stay up before you delete it too. No, the reason I have been deleting your posts is because you keep repeating the same misrepresentation over and over again. You’ve even done it again in this post. You noted in your article that Camden High Street is unpleasant to cycle up. It’s also worth noting that it’s unpleasant to walk around, particularly if you are shopping, and want to cross from one side to the other. I wonder if Camden Council is considering either making the whole of the High Street two-way, or even better, reducing the road width, as has been done north of the junction with Camden Road. 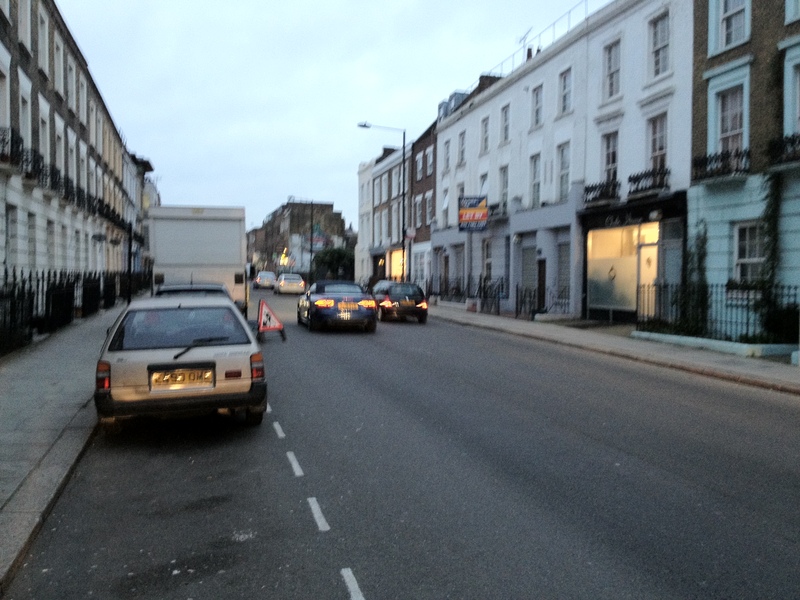 The roads around Camden Town are almost all one-way, and the area might benefit from a re-design. Yes, it’s a staggeringly awful environment. 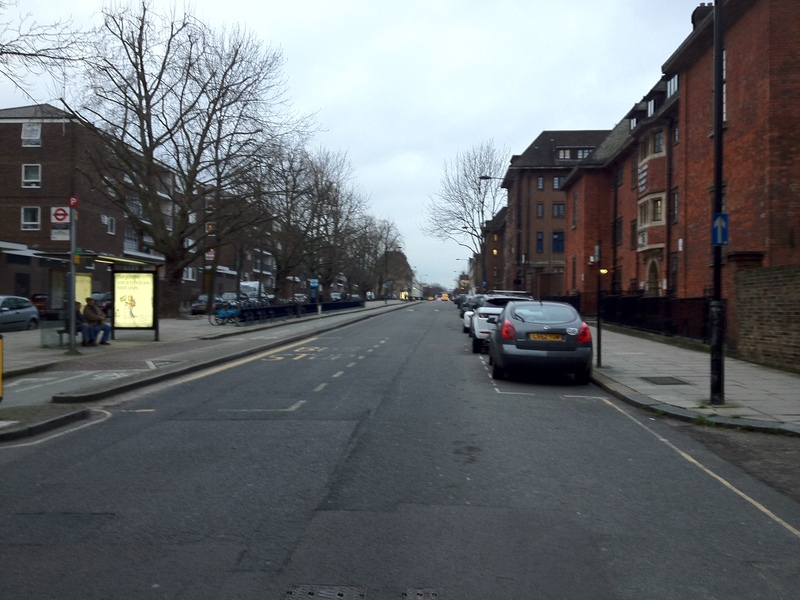 Worth remembering that Royal College Street used to be a 3 lane one-way road. The lesson is that you can take capacity away. 2 metres is really not very wide. I have encountered half a dozen elderly cyclists in the last few days on paths between two and three metres wide who were not remotely cycling in a straight line. I like to overtake slow and wobbly cyclists fairly slowly and with lots of clearance. But if they are wobbling along within a one-metre-wide envelope located 50 cm out from the kerb and the path is only two metres wide, it’s quite difficult to overtake considerately, or at all. I always make my presence known before overtaking; I’m aware that elderly cyclists can fall off their bikes purely as a result of being startled. But today I gave an old man a fright despite my best efforts: when I rang my bell, the two elderly cyclists in front of me on the cycle track moved to single file and I mistakenly interpreted that as a reaction to my presence behind (when it was actually a reaction to some hazard they had spotted ahead.) As I was overtaking the second cyclist, he swung right towards me (a good 45 degrees off his straight-on course, and completely unaware of my presence) and he would have ploughed into me had I not been within centimetres of the far edge of the path with one knee in the greenery in an effort to give him space. If there had been a kerb (rather than just a hedge) at the outer edge of the path, that would have been trickier. I hope your feedback about the 45 degree kerbs is taken on board and added to the design before this gets built. I think it’s more than a minor quibble; needing to leave a safety margin to a vertical kerb reduces the effective usable width of the path significantly. In an ideal world, the cycle tracks would be wide enough to facilitate multi-generational use at a range of human-powered speeds. Onstreet parking would not be seen to have any place on a major cycle route. In the less than ideal world within which this design represents best practice and on-street parking seems to be non-negotiable, I would personally favour design solutions that make it easier for (relatively!) faster cyclists to move out into the main carriageway, overtake exceptionally slow cyclists, and then move smoothly back on to the cycle facility. I’m aware that dyed-in-the-wool “keep-up-with-the-traffic” vehicular cyclists can ignore the track altogether. But how does a timid cyclist of around sixty who wants to use the cycle facility safely get past two very slow and very wobbly ninety year old cyclists ahead of her on a 2 metre wide track? Vixen, I could use some of your positivity about cycling in London!